A very common trope in pretty much any adventure or action franchise is that of the robotic duplicate. 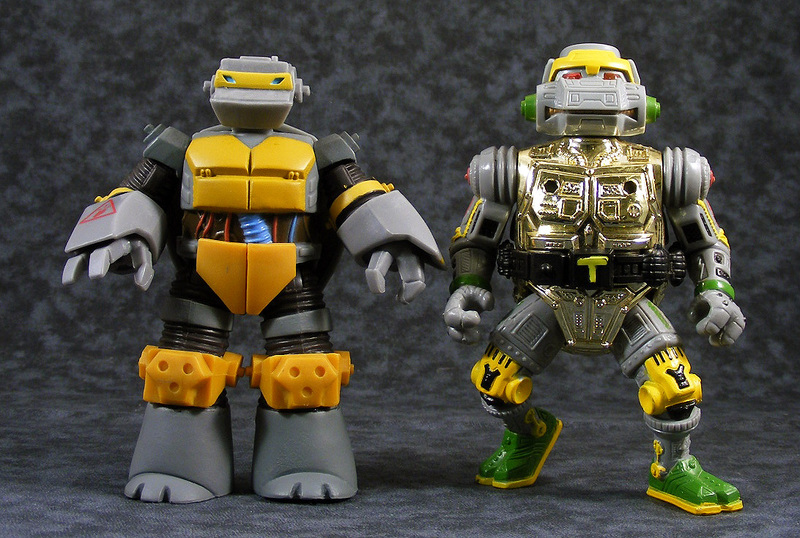 Masters of the Universe had Faker, Godzilla had Mechagodzilla, Wolverine had Albert, the Power Rangers had the Robot Rangers, King Kong had Mechani-Kong, Data had Lore – and the Teenage Mutant Ninja Turtles had Metalhead. 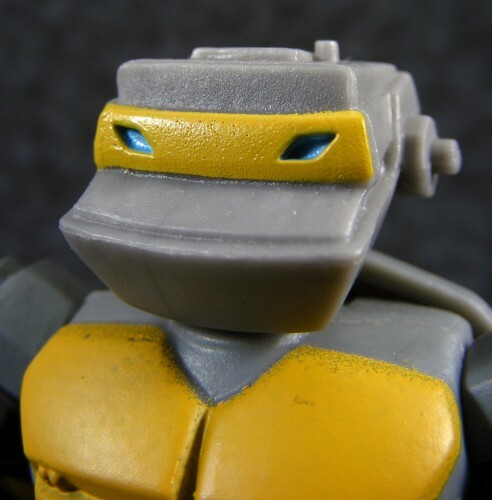 Like MOTU before it, It was often pretty clear on the 1980s TMNT cartoon that a character would originate as a toy concept before appearing on the show. A robot Turtle was probably a no-brainer, but what made the original Metalhead so cool was all the detail and features in his design. The chrome torso and “light pipe” eyes were already enough to make the figure stand out, but the interchangeable right arm, which could be swapped with a pair of robotic nunchucks, added even more value to an already awesome toy. So it’s a bit disappointing that over twenty years later, Playmates can’t even match, much less top, their first attempt at the character. The new Metalhead arrives as part of the toyline based on the new cartoon show. (As far as I can tell, fans haven’t arrived at a good shorthand term for the line. “TMNT 2012” is as weak as “MOTU 200X”; year-based terms are so lame.) Metalhead appeared on the show just around the same time he appeared in toy stores, which is a nice bit of synergy I haven’t personally witnessed in a while. Packaging: I mentioned how much I like the new packaging in my review of Leonardo. I’m a big fan of the purple-and-green color scheme – it’s eye-catching, easily-identifiable and helps any kid make a beeline for the Turtles at the store. Design & Sculpt: The new Metalhead is essentially an update of the vintage version, but re-envisioned through the CGI aesthetic of the new show. He’s got the big Popeye-esque forearms and wide, three-toed feet. 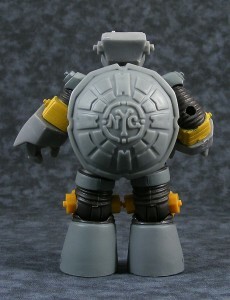 His “shell” is a manhole cover, which is a nice touch. 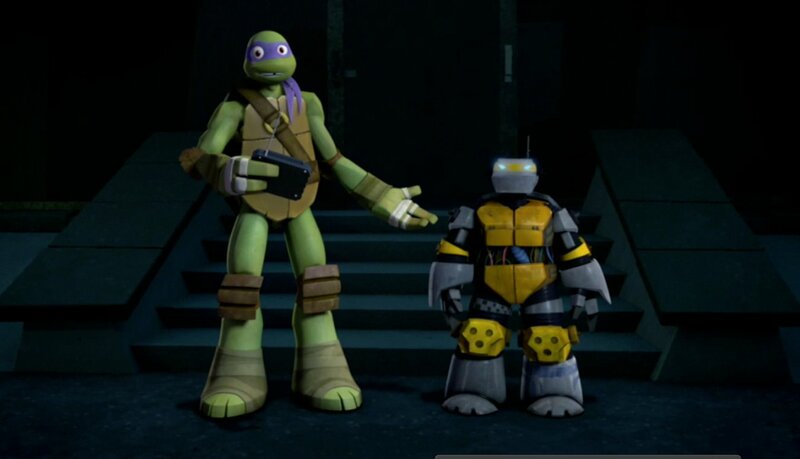 One thing you’ll notice right away is that he’s shorter than the Turtles, but that’s accurate to how he was depicted on the show. In fact, if you watch the video above (or look at the screen capture below), he should be even smaller than he is. His right forearm has a hole in it through the palm to the elbow, so that you can load up the red “laser blast” missile. Oddly, the arm doesn’t actually have a mechanism to fire the missile from his arm – it just sits there. If you push the missile forward out of the palm, you can give it a neat “mid-fire” look, but it does raise the question as to why the missile can go all the way back through the elbow. I’d hazard a guess there was a plan to have the missile actually shoot out, but it was removed due to cost or safety reasons. 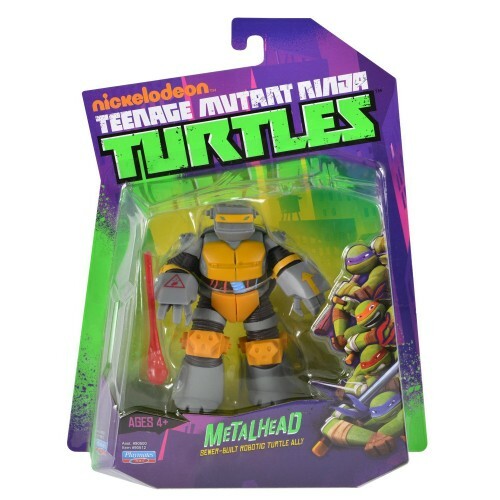 Plastic & Paint: Like Leonardo, Metalhead is a solid, durable toy. You’re unlikely to break him unless you’re really rough with him. 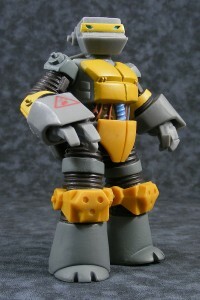 The head, forearms, and torso are molded in light gray; the upper arms and legs are molded in dark gray, while the two parts just above the pelvis are molded in soft yellow rubber, and the “kneepads” are also molded in yellow. Despite the simplicity of the design, the paint work is lacking. For example, the yellow paint on the “bandanna” doesn’t even continue down the sides of the head. The paint seems to fade away around the edges of the upper chest, and while the red “don’t touch” tampo on the right forearm is sharp, the yellow arrow on the left arm looks like the image on a pre-faded hipster t-shirt. That might be by design, however. The paint is a bit sloppy on the elbows and upper arms, as well as the upper legs. It’s not deal-breakingly bad, but I did look through a few different Metalheads before picking the one I wanted. More importantly, the paint work isn’t accurate to the character’s look in the cartoon. The “bolts” on either side of his jaw are black in the cartoon, whereas on the figure they’re unpainted. There should be a checkered pattern on the right thigh, which isn’t here, and the two rectangular bits above the inner elbows should be gray; the dots on the “kneepads” should be black. I suspect the reason for these limited paint apps was to save money. I may not like it, but I can understand the reason for most of it (except the lack of yellow paint along the sides of the bandanna – that’s just lazy). I know the toys and the cartoon versions of those characters hardly matched up in the 1980s, but back then it was the figures that were more detailed, not the cartoon versions. Articulation: Metalhead features a ball-jointed head, swivels at the elbows, swivels at the forearms, ball-and-hinge joints at the hips, hinges at the knees, and swivels at the top of the feet. 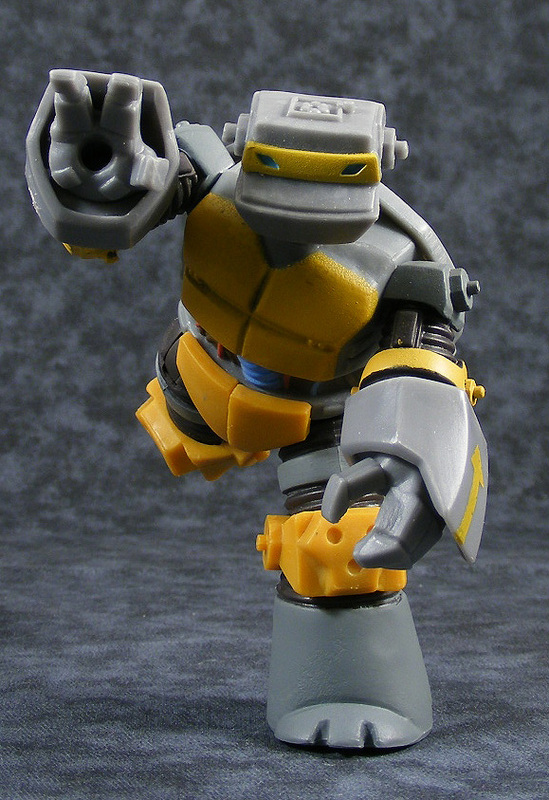 The lack of ball joints at the shoulders and hinges at the elbows is disappointing, but it appears to be par for the course for this line – the Turtles figures got the works, but most other figures in the line are being shortchanged in the articulation department. I suppose the right elbow lost the joint for the useless missile feature, but why not on the left arm? I suppose it could be argued that the arms are too short to make a good hinge joint, but my hunch is it was simply a cost-saving measure. Of course, the vintage Metalhead had even less articulation than this, but again, it’s twenty years later and we’ve come to expect a bit more. Still, while I’m mildly disappointed, this is, again, not a dealbreaker. And the ball-jointed head must be commended. Accessories: Metalhead comes with the aforementioned laser missile, and that’s it. It would have been pretty cool of Playmates to include the remote control Donatello used to control him. Quality Control: I haven’t heard of any QC problems, and I had none with my figure. Overall: While not a bad figure, I just don’t think the new Metalhead lives up to the old one. The original had chrome parts, interchangeable limbs, and light-up eyes. The new one has a non-firing missile. Part of the problem is due to the design of the character (i.e., chrome parts wouldn’t match the cartoon design). And the new version does have better articulation. But in my opinion, it’s not enough to make him more than just an average figure. What gets me is you can easily see how just a bit more effort on Playmates’ part could have made this figure a lot more fun. As others have speculated, it does seem like Playmates sunk much of the production budget for this line into the Turtles themselves. Hopefully the line’s runaway success will allow Playmates to spend a bit more on future non-Turtle figures. 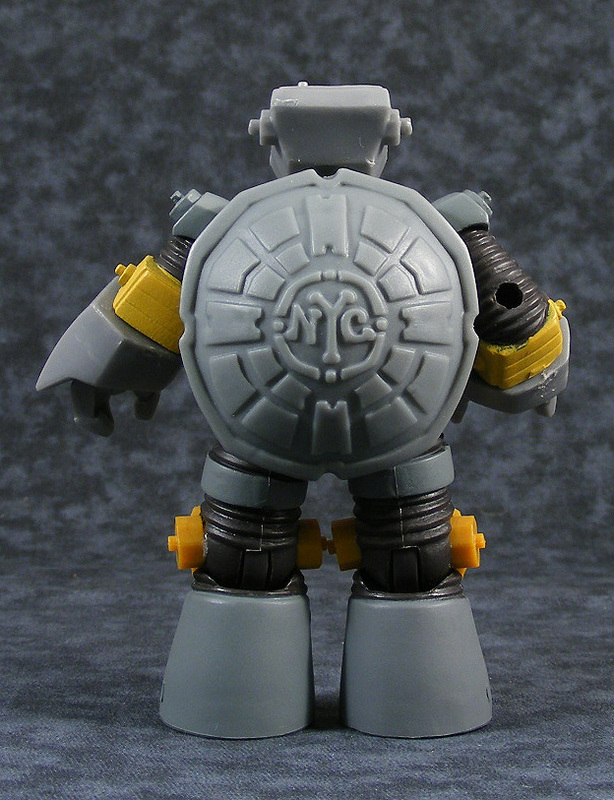 I wish I liked this Turtles line more than I do but they just don’t do it for me. Also, I don’t know if it’s actually article worthy but in case you missed it today is technically “Happy Strobo Day” for subscribers. I suggest NickTMNT for this incarnation. I also agree that the line is really just so-so to me. I like the look of some of the basic figures, but beyond the Turtles and Metalhead, I haven't felt like picking up any (and I traded for all of them rather than actually spending the money in a store). I wouldn't hold my breath on articulation. The Playmates standard since the original line has been well-articulated Turtles and basic articulation for everybody else. At least the humans occasionally get more than 5 POA in the new line, which is actually an improvement. Yeah, I thought it was 'Nick TMNT' or N.TMNT. I would also like to enjoy this line more. The turtles were great, if lacking accurate head sculpts. That seems to be remedied with the later action feature figures, hopefully they will get some new heads on the original four in the future. 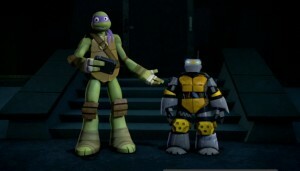 Yeah, I think Nick Turtles or Nick TMNT is where its at. He kind of reminds me of the flat gray robot from the NES game. If you "load" the projectile, then point the arm, and push the back end of the missile, it pops out and "fires". It's just designed without a spring mechanism. It's also not as likely to put out an eye. I instinctively tried doing that, but it didn't really go very far. Dongpound should be one of the best offerings, only only for size and detil but he is a fail. Its obvious this line is meant for kids, and its not like they didn't miss out on a few paint apps here & there in the vintage line… but a few extra paint apps here & there or a little more artic would make a world of difference. This is such a mediocre line that I'm shocked that it made so many "best of" lists last year. 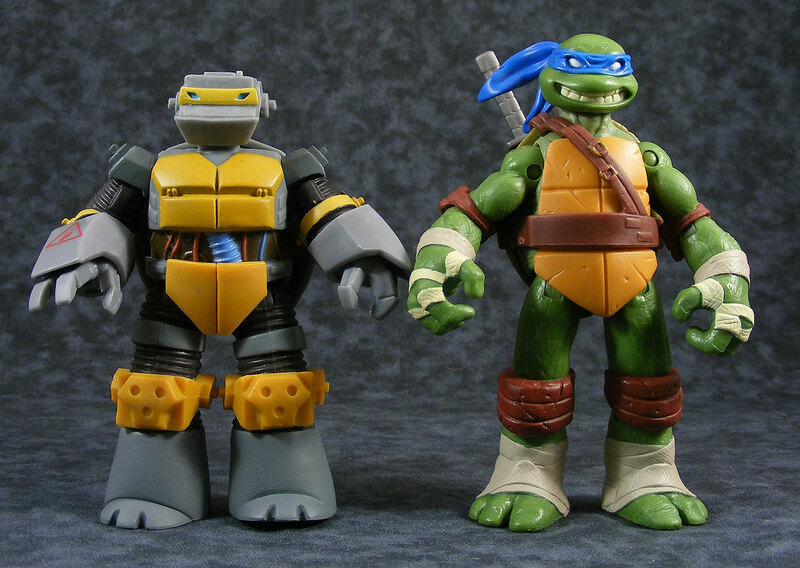 Yeah, the turtles are good, NOT NECA good, but good. But the rest of the line is trash, with some figures on par with Bandai's crappy Power Rangers lines–with lest articulation even. I've thought the same thing since the first figures were released. This is a good line for kids, but I don't understand how so many collectors are so enthusiastic about it. 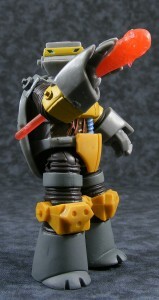 With the poor articulation and paint for most of the figures you might as well go buy vintage TMNT.